The Plaza: The Secret Life of America’s Most Famous Hotel out June 4. Journalist Julie Satow's thrilling, unforgettable history of how one illustrious hotel has defined our understanding of money and glamour, from the Gilded Age to the Go-Go Eighties to today's Billionaire Row. "Wide-ranging and compulsively readable… Not since Eloise was written has anyone captured so charmingly the glamour and spectacle attendant on this hotel, but here we find also the seaminess of a place where the rich have manifested their most despicable tendencies and their most naked ambition time and again. The story of the Plaza as told in these pages is the story of New York’s last and greatest century." 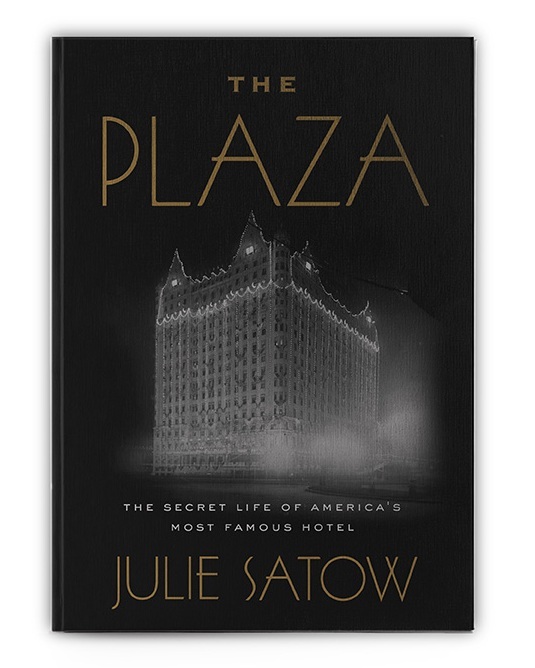 "In her thoroughly-researched book, Julie Satow delivers the delicious and engrossing tale of a century of history at the iconic Plaza Hotel, recalling its triumphs, unearthing its secrets, and bringing to life a revolving parade of famous owners and even more famous guests." "The Plaza Hotel has a long, sometimes storied, sometimes sordid history. All of it is compelling. People often use the expression, 'If these walls could talk…' Reading Julie Satow's wonderful and revelatory history of the fabled hostelry, I couldn't help but think that they'd talked—a lot—to her." "Julie Satow's THE PLAZA expertly shows not only the characters and events that shaped one of New York's most iconic landmarks but how it became a plaything of a global class of uber-wealthy whose questionable finances often ran through tax havens and Swiss bank accounts." "Julie Satow has written the definitive biography of the Plaza Hotel—and it is a biography, because the Plaza has been a living, breathing part of New York's cultural, political and business landscape for more than a century. She captures the Plaza's glorious, ribald, tortured history in all of its dimensions and offers a thorough and poignant account of almost everyone of note who has passed through the hotel's doors or scrambled to claim it as their own. Elegance, decadence, power, money, greed and dreams have all resided at the Plaza, and this is the narrative that weaves all of that together—lovingly and knowingly." "Covering billionaires to laundresses, charlatans to lovers, Capote to The Beatles, THE PLAZA captures the pulse and fortunes of 20th century New York. Millionaires such as Vanderbilt, Bloomberg, Trump, and Macklowe enjoyed themselves amidst Scotch whiskey and damask. Eloise's haunt comes to life through Julie Satow's lively writing and meticulous reporting, providing an enticing window into one of America's great institutions."